Seiko is one of the world’s most successful and innovative watch manufacturers. Cutting edge innovation and luxurious refinement embody Seiko watches today. The company currently known as Seiko Corporation was founded in 1881 as K. Hattori & Company, Ltd., as a wall clock repair operation, and quickly expanded to manufacturing wall clocks. In 1924, K. Hattori began producing fob watches using the Seiko name. Seiko gradually became well known in the watch industry and became a pioneer by creating technological advances including the first self-winding watch in 1955. By 1988, Seiko brand introduced battery free quartz watches and watches that were multi functional with alarms and timer features that operated through state of the art computer chips. 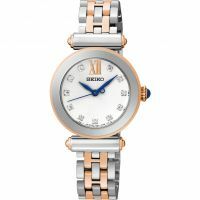 As the company became known for its watches, K. Hattori & Company produced watches under different subsidiary names, but in 1990 the company formerly changed its name to Seiko Corporation. The reliability and quality of the watches helped the Seiko brand become the designated timepieces for major sports events in a number of countries. Seiko was the official timer for the Olympic Games in Tokyo in 1964, World Cup Football in Mexico in 1986, and other events internationally in subsequent years. The Seiko name gradually diversified and divisions in Seiko Optical Products (1996) and Seiko Jewelry (1997) were created. In 1998, Seiko debuted the first watch propelled by body heat. By 1999, Seiko created watches that automatically self-corrected current time. Seiko has been on the cutting edge of technology, accuracy, and reliability with its products making it a premier brand internationally that stays a step ahead of consumer needs. Seiko watches combines style, function, value to provide a vast selection of watches that is sure to satisfy discriminating customers. Both women and men will find a handsome selection of quartz, kinetic, diving and even watches enhanced with beautiful diamonds. Ladies watches are designed with different shapes and styles of faces as well as varying wristbands that are sure to complement any size wrist. 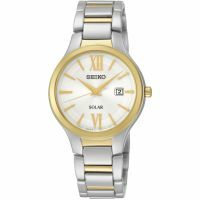 Whether a women is seeking a watch for work, sports, or to complement elegant evening wear, Seiko offers a watch to match her style. 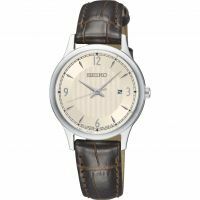 The bulk of Seiko men’s watches feature round faces and are designed for work, dress, or sports. Understated classic styling allows most watches to be equally suitable for work and play. Both women’s and men’s styles have varied features including alarms, calendars, and battery free movement depending on the model. Seiko consistently provides durability and comfort to wearers providing consumers with a brand they trust that has withstood the test of time. Seiko offers quality watches for every budget and taste making them the perfect choice for functional style.